Research indicates that children are more likely to use complex language in the outdoor environment and our own children regularly tell us that it is where many of their unmastered challenges lie. Inspired by this, the principles of Woodland Schools and the Kindergartens of Denmark and Norway, we established our Beach School in 2009. 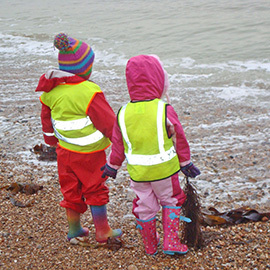 The children visit and revisit the same part of the beach several times throughout the year with their key worker and other children from their group. As in the Nursery environment the adults follow the interests of the child encouraging them to engage with their environment and the changing weather and seasons. Children have the freedom to explore and make their own discoveries. It is amazing to see the children’s relationships with the place and with each other develop over their visits. 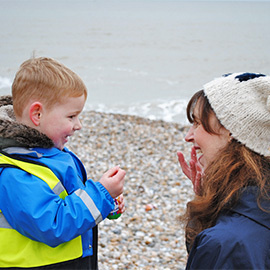 Parents play an important role in their children’s Beach School opportunities with many parents joining their child’s group and sharing in the experience with them. Parents, please speak to your child’s keyworker for more information about your child’s visits to the beach.